Finally, we are getting some soup weather here in Ely! I woke up this morning to crisp, chilly air and soon after breakfast I started thing about making soup for lunch. I know, I can’t help it I think about food all day. Well, I wouldn’t be a food blogger worth my salt if I didn’t. I love soup season, I love the smell of onions and garlic simmering away, filling the house with the hope of a lovely warming lunch. I love wrapping my hands around a big bowl of homemade soup knowing it is full of goodness. And this spicy vegetable soup is one of my all-time favourites, a simple soup, big on flavour and totally satisfying. Soup is one of the easiest things to make and I think one of the best things you can make for yourself, especially when the weather turns colder. There is something very soothing, therapeutic even, about a warm bowl of soup. It’s the first thing I want when I’m feeling under the weather, especially when coughs and colds start doing the rounds! Pile in lots of garlic, ginger, herbs and spices with your favourite vegetables and your away. And what better way to use up the odd veg hanging around your fridge, save them from the bin and make some soup! 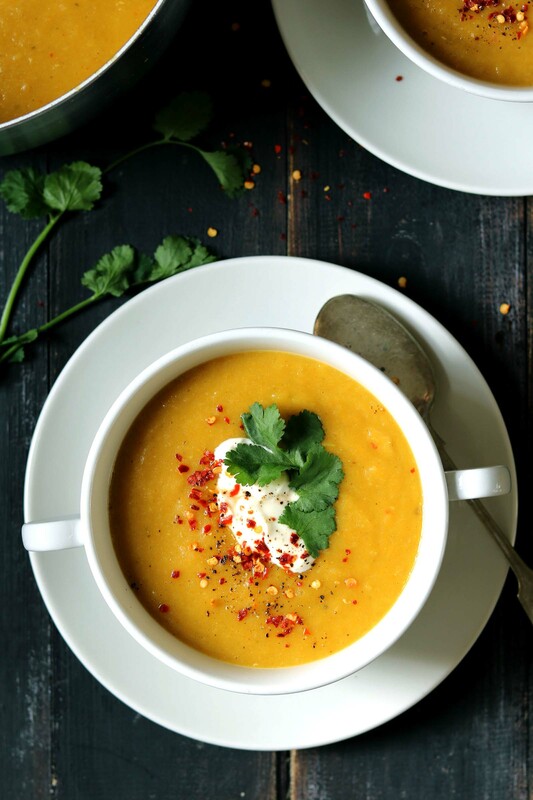 This spicy vegetable soup is packed with veggies and I added some red lentils to make it a complete meal. I like my soup thick and smooth so if prefer a thinner soup, look away now. This soup is thick, smooth and creamy, it has just the right amount of heat but not too spicy as to overpower the flavour. I like to sneak in as many vegetables as I can into my soups, the kids will never know how good this is for them 😉 For this soup, I used carrots and parsnips, butternut squash and a leek for good measure. You could use any starchy vegetables you have lurking around your kitchen. I serve this soup with a dollop of Greek yoghurt, a sprinkle of red chilli seeds, some fresh coriander, not forgetting some very good crusty bread. Keep any leftover soup in an airtight container, in the fridge once cooled, it should keep for up to 3 days. You can also freeze this soup. Leave the soup to cool completely then transfer to freezer bags, label clearly then pop them in the freezer. To reheat the frozen soup, empty the contents into a saucepan with a little water then cool over a low to medium heat until the soup is piping hot. Or you can thaw your soup the night before and then cook as normal. This spicy vegetable soup is naturally vegetarian and the vegetable stock is made by using a vegetarian and gluten-free vegetable bouillon. A warming, satisfying spicy vegetable soup with red lentils. Heat the oil and butter in a large saucepan, over a medium heat. Add the onion and cook until the onion is soft. Add the celery and leek and cook for about 5 minutes, then add the ginger and garlic, cook until you can smell the garlic. Stir in the spices, coriander stalks and chilli flakes and cook for about one minute. Add the vegetables to the pot then cover with the stock, now add the lentils, salt and pepper and give everything a good stir. Bring the soup to the boil then reduce the heat and simmer for 20 minutes or until the vegetables are cooked through. Check the seasoning and add more salt or pepper if needed. Use a hand-held blender to blend the soup to a smooth soup. If you find it too thick for you then add some water and blitz again with the blender. Serve with a dollop of Greek yoghurt, more chilli flakes, coriander leaves and some good crusty bread. This looks so inviting. I love it’s bright cheery colour. I’d want this every time I visit our beach hut!